The following comment was made 2008 March 5 at 11:11 am. I edited it to remove a broken link. The most relevant part of Norstad's article is the section called "The Option Pricing Theory Argument" and the preceding one called "Probability of Shortfall". He gives more detail in section 6.8 of his paper Random Walks. I'm still digesting the theory behind Black-Scholes, but here is a quick demonstration that something is wrong with Norstad's arguments. Suppose that I'm an insurance company insuring a $100 investment against underperforming a risk-free 6% return over 40 years (this matches Norstad's example). Norstad says (in the Probability of Shortfall section) that the probability of the S&P 500 underperforming a risk-free 6% return over 40 years is 10%. Let's say I'm pessimistic and assume that any loss is a complete loss of the entire investment. If I collect a $10 premium and invest is risk-free for 40 years, it will grow to 10% of the maximum I would have to make up to the insured party. Since I will only pay out with 10% probability, and I may not have to pay out the full amount, this is a good deal for me. However, Figure 4 in the Random Walks paper says that I need to charge about $45! There is something wrong here. The graph in my post was generated assuming a lognormal distribution of returns. Beyond that, it is just math -- no extra assumptions on my part. The graph shows the expected top-up payment from the insurance company obtained by integrating the lognormal probability distribution function multiplied by the amount of top-up over all negative returns. If you look at the formulas in section 6.8 of the Random Walks paper, you'll find that by applying Black-Scholes, the price of the put option is independent of both the risk-free rate and the expected rate of return of the S&P 500! (See the final expression for P in the middle of page 26. )So, my example is consistent. I'm assuming that Black-Scholes has some built-in assumptions about rational pricing. I'm looking for a sufficiently detailed discussion of Black-Scholes to find out more about the underlying assumptions. Wow, this is fascinating--that the insurance price is independent of the returns, either of the investment or on the risk-free one to which you make the comparison. But shouldn't the insurance premium go to zero for all time horizons if the risk-free rate goes to negative infinity? 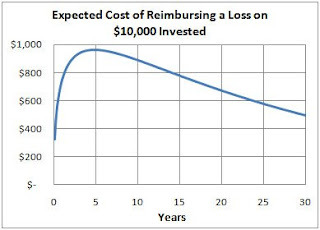 The probability of beating losing everything instantly should be 100% and be insurable at zero cost. Conversely, shouldn't the premium go to infinity as the risk-free rate does since the probablyity of beating an infinite rate of return is zero? Well, I can't possibly sort this out. That's why I read your blog and also John Norstad's articles. But when they contradict...??? Anyway, thanks for your attention to this. If you sort it out I'd love to see it explained. Best of luck! According to this article (if I read it correctly), Black-Scholes option pricing has a built-in assumption that the expected compound return of any investment is equal to the risk-free rate of return. Based on this assumption, the risk of owning stocks definitely does increase with time. However, historical data tell us that this assumption is far from true with stock investing. The longer the time period, the more that Black-Scholes option pricing will deviate from reality. This accounts for the difference between my analysis and Norstad's. What you say makes sense to me, right up to the last sentence: that this accounts for the difference between your analysis and Norstad's. Aren't there other differences that may matter? I think that the Black-Scholes assumption of equality of the expected return on investment and the risk-free rate is certainly one difference between what you did and what Nordstad (and Bodie) did. It is also certainly true that, historically, the market's return has dominated risk-free returns. But does that mean that market investment risk goes down over longer time horizons? Norstad's other ways of looking at this question in his Risk and Time paper suggest not. It would seem that there are, perhaps, other differences between Norstad's analysis and yours. Is there a way to apply a Black-Scholes type approach when the expected return on investment is above the risk-free return? Or is the return equality assumption fundamental to such an approach? If it can be done then it could be seen if the insurance premium goes up or down in this case and that would eliminate all the other differences between what you have done and Norstad's analysis. Whether risk increases with time depends on what risk you look at. Standard deviation is proportional to the square root of time. So, confidence intervals on your portfolio value widen with time as Norstad and Bodie argue. In this sense, risk increases with time. But, what about the risk of underperforming the risk-free return? As time moves on, you can imagine your confidence interval widening, but the risk-free return is falling within that confidence interval. After 30 or 40 years, the confidence interval is wide, but almost all of it is above the risk-free return. In this sense, risk drops over long periods. The Black-Scholes analysis gets this part wrong because it forces the risk-free rate of return to remain in the middle of the confidence interval. You ask "Is there a way to apply a Black-Scholes type approach when the expected return on investment is above the risk-free return?" This is essentially what I have done with the graph in my post. You can plug in different numbers, but the graph will have the same basic shape: it will increase to a maximum and decrease thereafter. Bodie and Norstad are right that stock investing is risky, but almost all of the risk is to the upside when compared to safe investments (as long as you hold on long enough). I'm trying to make sure I understand what you said. Would you agree with the following way to look at it? If the return is higher than the risk-free return then the expected performance over time grows relative to the risk-free investment and, as you say, there is less downside risk than upside at any point in time. It is like driving along a line through the bottom portion of the confidence interval. The upside risk cancels out the downside risk and by a larger margin over time so the insurance premium is smaller for longer time horizons. However, if the return on investment is the same as that of the risk-free return, then the upside (beating the risk-free return) and downside (underperforming the risk-free return) have equal risk. It's kind of like driving right down the middle of the confidence interval. Would not the two risks cancel each other exactly so the insurance premium should be constant over all time horizons? But Black-Scholes says that the premium increases. What's wrong with this way of looking at it? The insurance premium is determined by the region between the risk-free rate and the bottom of the confidence interval. The region above the risk-free return is irrelevant because the insurance company pays nothing for outcomes in this region. In the case where the risk-free return stays in the middle of the confidence interval, the premium rises over time because the confidence interval is widening over time. The pay-out region widens over time. When the expected compound return on the stock investment is higher than the risk-free return, the situation is more complicated. Initially, as time increases, the confidence interval widens, and the risk-free return begins to drop within the confidence interval. However, the gap between the risk-free return and the bottom of the confidence interval is widening. In the example in my post, after 5 years the risk-free rate starts dropping fast enough to more than compensate for the widening confidence interval. This means that the gap between the risk-free rate and the bottom of the confidence interval begins to narrow. This is why the insurance premium initially rises, but then begins to fall after 5 years. Keep in mind that this 5-year figure will change depending on what assumptions you make about the returns and variances. I believe I finally understand. Thanks for your patience. I find your analysis more convincing and useful than Norstad's since it is closer to realality. After all, who cares about the risk of an investment falling short of a risk-free one with the same rate? Such a risk-free opportunity would not exist. This all makes me wonder if one can't use your analysis to justify some common advice about the minimum time to hold an equity investment. Typical advice is at least 3 years; others say 5. I know your analysis depends on assumptions (and one's decision of hold length would depend on risk aversion) but it might be used to at least clarify the necessary values of return, volatility, and risk aversion to justify a certain length of time to hold. After much scratching, I've managed to come up with an expression for the price of a stock option based on a lognormal distribution of stock returns. It turns out that Black-Scholes is just a special case where the underlying investment has an expected arithmetic return equal to the risk-free rate. (This means that its expected compound return is below the risk-free rate due to volatility). Some of the summaries of Black-Scholes I've read claim that a big part of their achievement was solving the equations after creating them from their assumptions. I find this hard to believe given that I managed to come up with a more general solution in about 2 hours work. Given how easily I came up with it, I'm guessing that everything I've done is already known.